Office complex implants RFID chips in employees’ hands (voluntarily) #WearableWednesday « Adafruit Industries – Makers, hackers, artists, designers and engineers! CopmuterWorld has the story on an office in Sweden where workers are having RFID chips implanted in their hands. Would you volunteer to get an RFID chip implanted in your body for work? The employees working at Epicenter, a 15,000-square-foot building in Stockholm, can even pay for lunch using their implants — just as they would with the swipe of a credit card. 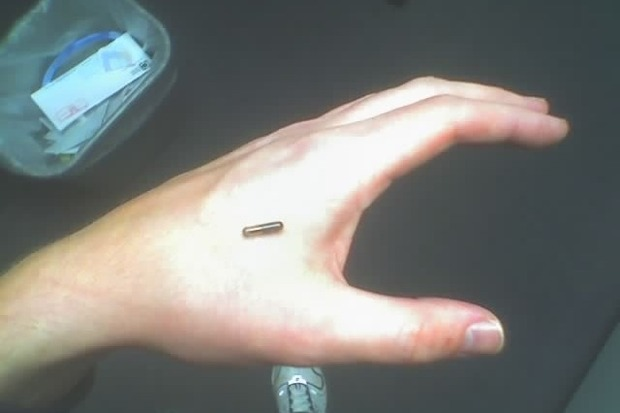 The RFID implants are a bit larger than a grain of rice, and Sjöblad’s group tested the chips last year. Bionyfiken has just launched a nationwide study on RFIC/NFC implants. Participants in the Bionyfiken project normally pay for their own implants. There are even “implant parties,” that involve from eight to 15 “implantees” and a bit of socializing around the experience. The fast-growing Bionyfiken RFID implant community is made up by a diverse group of people who see “experimenting with technology as a natural way of life,” the organization’s webpage states. “The chips are easy to insert and just as easy to remove. The life length of a chip implant is long. I expect mine to last for 10-plus years, but likely I will want a newer model before that time,” Sjöblad said.